Alice-Aliya perfume atomizer bottle - Refillable glass perfume cologne atomizer bottle with bulb atomizer sprayer for perfume atomizers, travel size perfume atomizers and crystal perfume bottles as well as atomizer attachment for your widely choice. 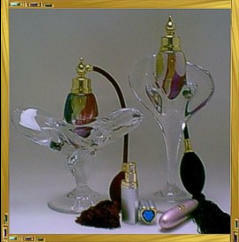 Manufacturer specializing in Art perfume bottle, crystal perfume bottles and bulb atomizers, atomizers attachments. Copyright (c) 1998 Alice-Aliya (Canada) Inc. Last modified: Nov. 11, 2013 The leading manufacturer specializing in perfume bottles, bulb perfume atomizers from Canada. Thanks for interesting in our perfume atomizers and bottles. We are in the position to supply our products at wholesale price. As our wholesale price is varies according to the item and customers order' quantity, therefore, please kindly let us know the item number and quantity you like? we will then quote you our best wholesale price accordingly. Our minimum order for wholesale purchase is US$300.00 per order, 3 pieces per item/color. If you want to purchase samples or to see more detail of article, such as size, capacity, finished as well as our regular price... etc., please kindly visit our direct ‘Online Store’. Should you have further questions, please feel free to let us know.